Thirty six games have now been completed with 15 to play to decide which national team will claim the 2016 European Championship. One side of the draw features most of the European heavyweights, whilst the other side offers the prospects of one of the less fancied nations reaching the final. The group stage provided some interesting and unexpected results, with four of the five teams (Wales, Northern Ireland, Iceland and Slovakia) participating in their first European Championship progressing to the round of 16, whilst the fifth Albania narrowly missed out. With the competition expanded to 24 teams and with four of the six third placed teams making it to through to the knock-out stages of the competition, every game has been important, with even some last placed teams going into their final game with every chance of progressing in the tournament. Goals have been harder to come by in Euro 2016, with the 36 group games producing a total of 69 goals, with the average number of goals the lowest since the 21 scored in 12 group games in Euro 92 in Sweden. Only three games failed to produce a goal, with both Germany and Poland the only teams yet to concede, whilst in that same group Ukraine were the only team to fail to score. When examining how the goals were scored, the highest percentage (29%) followed a passing move, with not surprisingly four of Spain’s five goals coming from this style and with half of Wales’s six goals following a passing move. Two goals were scored following long balls, one from Slovakia against Russia, whilst Italy’s opener against Belgium followed a Pirloesque long ball pass from Bonucci. Coincidentally of these long ball goals were scored in the 32nd minute of their respective games. Whilst the 10 goals scored from counter attacks account for only 14% of all goals scored in the group stage, some were memorable, perhaps none more so than Iceland’s dramatic late winner in 94th minute of their game against Austria; but the teams to fear most from counter attacks are Belgium and Croatia. Three of the four Belgian goals followed counter attacks, whilst three of Croatia’s five goals came from this style. 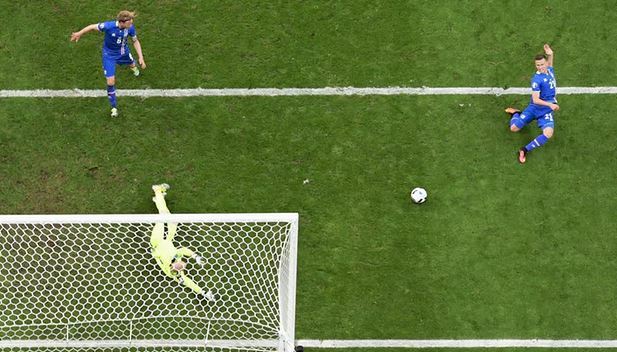 Set pieces, excluding penalty kicks, accounted for 22% of all goals, with two of the four penalty kicks successfully converted, accounting for both of Romania’s goals in the competition; whilst eight goals were scored following dribbles. There have been plenty of dramatic finishes, with late goals deciding a fair few games. Almost 28% of goals were scored between the 75th minute and full time, with 15 of these 19 goals scored in the final five minutes and with seven scored between the 90th minute and the final whistle. There were generally cautious starts to most games, with 11 goals scored up to the 30th minute and with just two goals scored before the 10th minute; however over 40% of all goals scored in the group stage fell in the quarter of an hour periods either side of half time. « Which Teams Found it Hardest to Defend Set Piece Crosses in Europe’s Top 5 Leagues?